that's right. and this post probably won't be the last one since i wear plaid quite often. i love wearing my plaid shirts with converse for a laid back look or dressing them up with a killer pair of coated denim jeans and heels. either way, plaid looks great and pairs with so many things! these were taken while we were in st. george (hence, palm trees in background) and it felt amazing to actually be outside without having to wear a coat! i'm already up for another trip down south for a little warm weather and it may come sooner than later! I have been obsessing over plaid lately! It's my favorite. This look is so cute on you! Love the plaid but totally crushing on your coat! Love that plaid top!! So pretty! those heels are amazing! i always love your plaid outfits! i absolutely love this look !!! 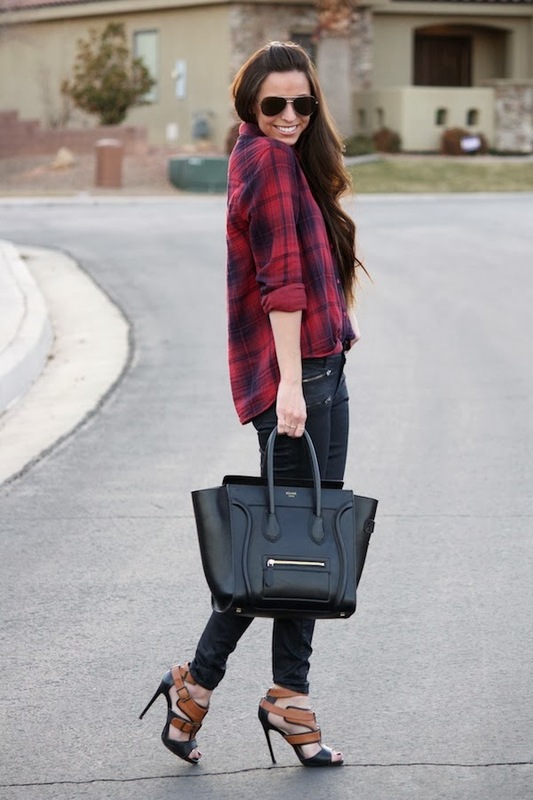 Loving that coated denim, it looks amazing with the plaid! SUPER cute! Pinned this one! That plaid shirt is pretty hot but I am super crushing on your mega hotttie pats and jacket! !